At 27 years of age, Alex released his first album Between Heaven and Earth on 31 March. He’s been writing it for almost two years, finding time between his hectic schedule as a session musician and jazz performer to create his own music. 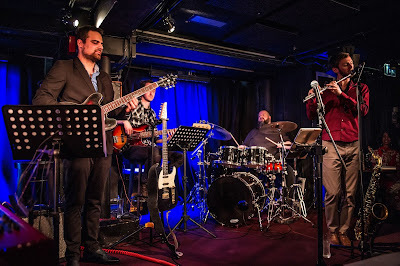 The album had its debut with a gig at Pizza Express Jazz Club. His album is full of original compositions as well as two covers. It’s fun, relaxing, and a thoroughly enjoyable listen. Alex started playing guitar at a very young age. “I guess it will be 20 years next month... I started with music theory and then studied classical guitar at the Geneva Conservatory. At the beginning I didn’t really like it though,” he says, clearly finding the irony. “I like the classical guitar now, but it wasn’t really what I wanted to do and I just wasn’t passionate. When I became a teenager I picked up my first electric, and I started playing every day. I played as much as I could, honestly 5-6 hours a day. I started with blues and rock, but it wasn’t until my degree that I got into jazz”.